Hello Fellow book lovers, and happy holidays. I am so excited for the holidays especially Christmas, it always makes my heart glow with joy and love. I am back here today with an awesome new book The Speaker. It is a Young Adult book from Putnam which came out on November 7th, 2017 and its the sequel to The reader. 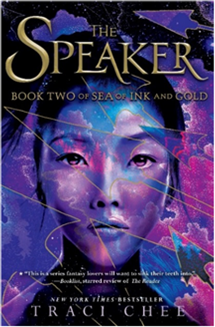 It is a series title Sea of Ink and gold. I would like to say huge thank you to Penguin Random for sending me both books in an exchange for an honest review. Now onto the summary and review of The Speaker. In this book, we continue with Sefia, Archer and Captain Reed stories. We originally met all of these people in the Reader. They seem to be the main characters in the Series so far. As we continue through the Speaker, We learn so much more about how all of these people came to be on their journeys. We learn more about Sefia parents, and what they did that cause them to be hunted. We learn Archer history and how he came to be apart of the story. We find out how Reed’s story ties into Sefia and Archer stories. We have gained so much more information on the War that seems to be going on in the story. Now that is all I am going to say because I don’t want to spoil the first book. I rated this book four out of five stars because of how crazy it is. The reason this series hasn’t reach 5 stars with me is because I feel like Traci Chee, put to many perspectives in the book. So many view points in one book tends to feel confusing sometimes. I felt really confuse by both of the books a lot because of all the points of view. At the same time I am anxious to see how everyone is tied to everyone else, which is something you learn through out this book. These characters and the story are very complex and have a lot of Depth to them. These characters can shock you sometimes with how they react to something. I was really shock by the fact that a few characters use Violence in this book as a numbing agent. The Violence explanation disturb me sometimes because of how it was use. I didn’t want to see these characters having to fight in order to feel better about themselves. It was almost like they where fighting to be more relaxed and using it as an escape of handling real life. This annoyed me and for this book to be a young adult book, the violence was a bit problematic for me. I was also really shock by this book because of some of the history revealed about the characters and their lives. This book just held so much information in it, that sometimes it became an overload to me as a reader. Now as for the book itself, omg is it beautiful. Both books contain deco edges on the pages and the covers are Asian inspired. The story has a ton of Asian influence along with Eastern European and India in my opinion. The Characters are more developed and have more explanation for how they came to be themselves. You find out fascinating plot information that makes you wonder more about these characters. I love the beauty that I can see in this plot, and these characters, that is raw and terrifying but makes them even more interesting. We also have more pirates in this book which I really love, I felt that was fascinating.The most unique thing about these books is that they unique and like nothing else, I have seen before. I totally still feel like these books should be read because they are extremely action pack. I feel like these are the type of books you will find something new about every time you read them. I honestly would say buy both of these books and read them because they are just that good. I have a feeling there will be more books in this series. As always I will leave the links to the author, books and my social media below. Thank you for reading this blog and please continue to follow me.